Motorcycle passengers are arguably the most overlooked demographic in the motorcycle industry. Two-Up Motorcycle Riding will provide both the rider AND passenger with important information to ensure a safe and enjoyable riding experience. Mario Orsini will share with you first hand knowledge of what to expect and anticipate while carrying a passenger on your motorcycle as well as important safety information, riding techniques and responsibilities for the passenger. 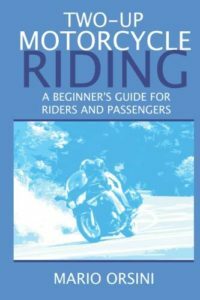 Riding a motorcycle two-up can be a LOT of fun and Two-Up Motorcycle Riding will provide you with all the information you need to get started. All Books will be autographed. Please let me know in the block below what name (if any) you would like inscribed.